Thread: Any tips for dealing with different player styles? So I'm a brand new GM and I've got some decent players. While I wouldn't call any of them power gamers persey, some of them put a lot more into their damage out put or their tanking abilities than others. Are there any suggestions on how to make sure I can get a good challenge to everybody without having some characters be invulnerable to most players and/or able to kill most players without a prayer? Re: Any tips for dealing with different player styles? I find one of the best ways to deal with this is just to present the players with a variety of opponents and a variety of situations to handle, not as punishment, but because that's the genre. Bricks, speedsters, invisible opponents, paragons, magicians, etc. Combat with supervillains, fighting two dozen gang members, heists, natural disasters, investigations, etc. Regarding combat specifically, there are a lot of effects to use to build enemy powers with, and a lot of game-altering combat circumstances to impose. Just being diverse with those should lead to everyone finding someone/something that challenges them... you shouldn't need to just effect- and resistance-shift every enemy. Anyone with too lopsided a character will have the moments they shine, and the moments they're utter failures, but if everyone is OK with that, it's a valid role to play. If the entire team is lopsided, they'll eventually encounter characters/situations they struggle to deal with, at which point you'll have an opportunity to (once again, as it should be mentioned when the team is first evaluated) suggest that at least the team be somewhat well-rounded, even if individual characters aren't. Maintain an open dialogue with your players. If you notice something becoming a problem, don't be afraid to address it with them. Yeah, the worst part of having style clashes is when communication is impaired to boot, either beforehand, or as a consequence of trying to avoid compounding problems. At the very least it can locate where people draw their lines about when they're willing to give ground and not. You can't, and you shouldn't. This is a comic book medium. In the comics does Batman stand a chance in a 1 on 1 fist fight with Darkseid? No. Does Superman? Yes. Yes, I know, people will chime in, "If Batman has time to plan..." or "Batman killed Darkseid in the Final Crisis Arc when..."
So, yes, Batman always wins when Batman has plot armor and plot devices. That isn't really the point. In a 1 on 1 without anything else there are certain opponents the Bat simply can't go toe to toe with. In this comic we had a perfect example of what happens. Batman gets thrashed, accomplishes no damage. 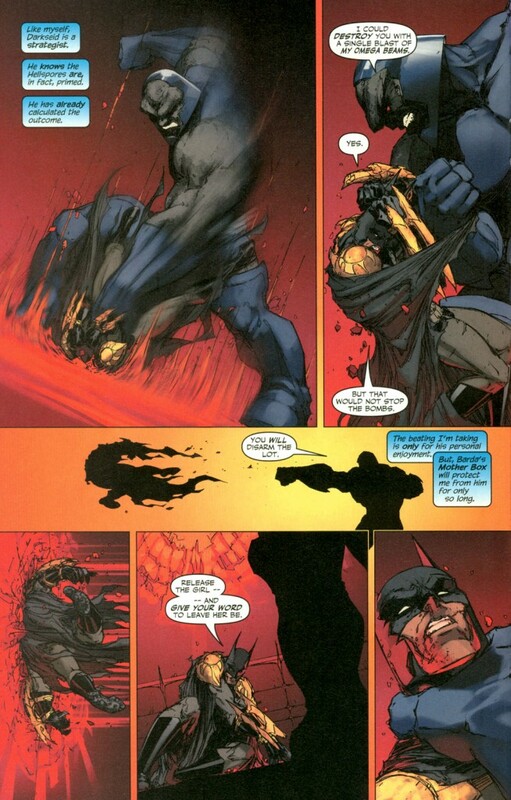 On the other hand, Batman still won here, because Batman knew he couldn't win in a fight and so he came up with a very good threat, that didn't rely on him beating Darkseid in a fight. Unfortunately that IS the burden for people who play the Batman type vs the Superman type. They need to play differently. They need to play a slightly different game. If the enemy is invulnerable to them, do they slug it out, or do they use hero points and try to find something to tip the scales toward the defeat of the enemy? In a fight where they can't slug it out it is up to them, and you, to have alternative methods for them to contribute. Maybe the guy who is defense shifted zips up to the baddie and uses Deception to Feint then passes it to the Big Strong Damage-shifted powerhouse that can't hit the broadside of a barn with Setup. Maybe he uses Trick to get him to take a swing at him with their big honking sword only to find out that now said big honking sword gets stuck in a wall when the Speedster dodges the attack. If the players, as you pointed out, aren't power gamers, then... They aren't doing anything wrong. To effectively force them to alter their characters because some other players made characters that aren't as combat proficient isn't really cool in my opinion. It is on the less combat efficient characters to find ways to participate. If they didn't spend the points on their combat, they spent it somewhere, and that means that there are places that they're going to shine that the combative characters won't.